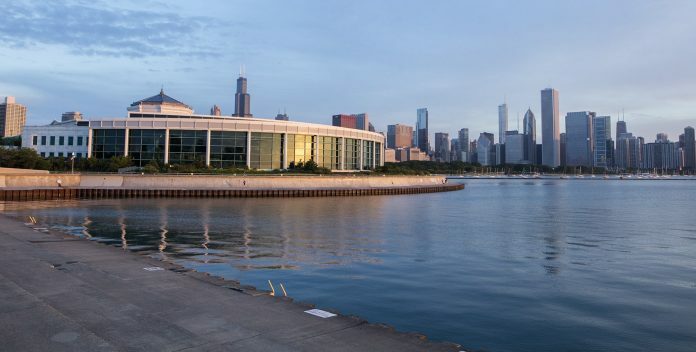 The Bank of America Chicago Marathon is partnering with Chicagos Shedd Aquarium to take on the issue of reducing single-use plastic pollution by joining the aquariums Shedd the Straw initiative for the 2018 Chicago Marathon on October 7. The partnership aims to reduce plastic use and encourage more sustainable alternatives for marathon participants, vendors and hotel and restaurant partners. One way the organizations hope to make an impact is by asking all Chicago Marathon hotel partners, restaurants and vendors to join the aquariums Shedd the Straw initiative for race weekend and hopefully, permanently. Participation involves serving straws only upon request and switching to compostable options such as paper straws. The aquarium recommends that participating businesses retain some straws on site for anyone who needs one. The cause encourages people who dont require a plastic straw to consider using a more environmentally friendly alternative or ditching the straw entirely. Information will be available race weekend at the Abbott Health & Fitness Expo, encouraging race participants, spectators and fans of the sport to learn more about Shedd the Straw. Straws are one of the top 10 most common items found in beach clean-ups across the Great Lakes, and are part of the 11 million pounds of plastic waste that enter Lake Michigan each year the equivalent of 100 Olympic-sized swimming pools. Because plastics cannot biodegrade, they simply break down into smaller pieces over time and endanger wildlife that might accidentally ingest the plastic or become entangled in it. Plastic bags and bottles are additional offenders, which can easily be replaced with more sustainable, reusable alternatives. The aquariums Shedd the Straw initiative began last year on Earth Day, when Shedd Aquarium launched its campaign encouraging people to switch from single-use plastic straws to reusable or biodegradable alternatives. Since then, more than 160 local restaurants have signed onto the cause, as well as larger organizations like the Chicago White Sox and Loews Chicago Hotels.